KAGUYA consists of a Main Orbiter at 100km altitude and two small satellites (Relay Satellite and VRAD Satellite) in polar orbit. The scientific instruments on board the Main Orbiter are used for the global mapping of lunar surface,magnetic field measurement, and gravity field measurement together with the instruments on the Relay Satellite and VRAD Satellite. The key technologies, such as the lunar orbit insertion and attitude / orbit control of the Orbiter are verified for future lunar exploration. It can look at the animated picture of KAGUYA from link under. 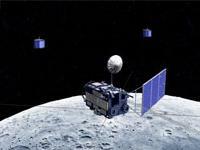 This animated picture is link to of "JAXA Digital Archives".